Codiaeum variegatum is definitely a must for our tropical garden. 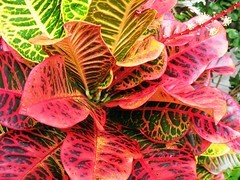 We love autumn colors and Crotons easily satisfy our cravings as they splash their fabulous autumn colors year round. We’ve been growing them in containers for decades. Slow-growing, easily maintained and its attractiveness are some of the plus factors that would influence any gardener to fall absolutely in love with these plants! Propagation: From seeds, air layering or stem cuttings, the latter method being the easiest. Just push a few 5-7 inch stem cuttings into moist soil or root them in water before planting. A word of caution – when propagating with stem cuttings, be sure to wear gloves as the milky sap that oozes from cut stems and leaves can cause skin irritation for some people. 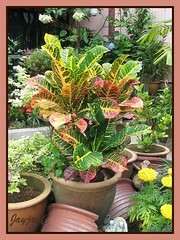 Features: These are very popular tropical shrubs reaching 3 m with their impressive ornamental foliage of awesome colors and varying forms and pattern.Their fabulous leaves can be broad or narrow/very narrow, spiral or smooth-textured or veined, large or small, recurved or otherwise, entire or deeply-lobed. etc. Wonderfully variegated, the leaves are splashed with colors ranging from green, yellow, chartreuse, red, burgundy, magenta, maroon, orange, etc. in various fantastic tones. There are probably a few hundreds of cultivars around the world!In sharp contrast, the Croton yellow-colored and star-shaped flowers are tiny and inconspicuous in long racemes. They’re delicate and drop easily in a day or two, though very few mature into seeds resembling tiny berries in shade of purplish-black. Usage: Very well-known for its colorful foliage, the croton bush will be most suitable as an accent in the patio, courtyard or garden. Whether grown in containers or in ground, it’ll present a remarkable sight when mass planted as hedges or borders. These strikingly attractive shrubs can be planted along highways and roadsides to beautify the scenery. Crotons attract butterflies, so plant them if you want these visitors to your garden! 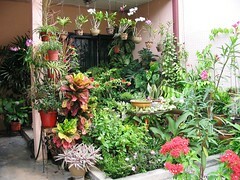 Care: Quite easily maintained with minimal care in the tropics! All it need is enough sunshine, lots of water, occasional fertilizing and check/control mealy bugs, spider mites and scale that may infest it. Prune Croton heavily (about one-third of branches) when needed to prevent unsightly stems and promote bushiness as most of the foliage are at the top of plant. This will shape the plant uniformly, presenting multi-level branching and create a more beautiful and attractive specimen. For potted plant care, here’s a croton production guide that detailed its physiological, bacterial, fungal and insect problems with symptoms and control measures! A wonderful fact sheet to peruse! Another interesting read about questions on croton. For temperate regions: Check this site for more plant info. Like bougainvilleas, an awesome lot of Codiaeum variegatum cultivars are found throughout our tropical country of Malaysia, which provides a conducive hot and wet environment for their luxuriant growth. Currently, we grow 3 cultivars, namely the fabulously veined and beautifully colored ‘Ann Rutherford’ Croton (or is it ‘Puccini’ Croton, I wonder? ), the lovely shaped ‘Arrowhead Croton’ in yellow and green, and the pretty narrow and slender leaves of ‘Picasso’s Paintbrush’ Croton in fantastic variegation of crimson red, green, yellow, etc. Sharing images of Crotons grown in our garden and elsewhere. Click on images to view large. Enjoy! 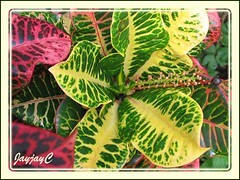 – cultivar from Thailand, with slender and twisted leaves in fantastic psychedelic colors. – ovate leaves in bright green, and beautifully spotted or speckled with bright yellow to gold. 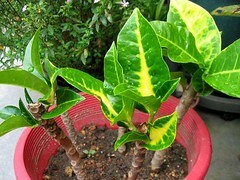 – long and very slender leaves, variegated in yellow and green. – ovate leaves, variegated in green, yellow and orange with a reddish tinge. NOTE: It has been noted at Croton Mania.net that there are at least 7 names given for each plant. Croton has several hundreds of cultivars/hybrids and varieties, probably numbering into thousands, that it is inevitable that some plants can have more than one name. Hence, please take note that the names assigned to our Croton images above, basing on online research, may be correct or incorrect. Greetings. I am archivist for the croton society, which BTW, is currently temporarily now in a state of flux, as Harold Lee has not been able to be active in the Society lately. About the Codiaeum images you show on your website, the one you call Ann Rutherford is a Cutler hybrid called ‘BRAVO’. The one you call ‘Arrowhead’ is not that one. ‘Arrowhead’ is spotted. What you show MAY be ‘Bob Halgrim’, …..i need to see further images. The one you show as ‘Picasso’s Paintbrush’ is not that one at all, but instead a much nicer variety, originating w/ the Old Royal Palm Nursery in Oneco over a hundred years ago, and is properly called ‘Rubrum Compactum’. The one you show w/ the truley elegant, long, narrow, weeping leaves i do not know(! ), but would certainly like to!!! I have a very large collection of old named varieties. If you’d like to trade, let me know. We appreciate you taking the trouble to identify our croton images above. However, since there are several hundreds of cultivars, hybrids and varieties worldwide, and most likely some crotons have been assigned more than one name, we’ll just let our named croton images remain as they are. However, we’ve just added a note at the end of our article just for record. hi jackie luv your site…too bad its not australian ( i am ) but very useful either way. my question is WHEN is the best time to propagate? this plant and all of your others? what season, is all I need to know. any chance u could add this info to the other plants aswell. This is how I found your site…by googling this question….and lucky I did !! thank you. ive added u to my fave’s. gr8 pics aswell ! cheers. Thanks for your lovely thoughts and kind comments, Mandy! Since Malaysia has an equatorial and tropical climate without the 4 seasons as experienced in the temperate regions, we’re able to propagate all our plants at any time year round with much success.